Decent work needs to be at the top of everyone’s agenda – working people, employers and governments. Decent work is the foundation of a decent life, the opportunity to earn a living and make a contribution to the community, writes Esther Lynch. Esther Lynch is ETUC’s Confederal Secretary. On October 7 every year, trade unions on every continent mark World Day for Decent Work. Workers organise through trade unions to achieve decent work: acceptable working hours, fair wages, sick pay, paid leave, etc. None of these things have been given to workers without their organising and mobilising together to demand them. In some countries they have not been achieved yet, and in others they are being stripped away. The enemy of decent work is, and always has been, corporate greed. Excessive profits can only be made at the expense of working people, and in recent years profits have been going up while wages have been going down as a proportion of total wealth produced. In Europe since the mid-1970s wages have been steadily falling as a % of annual wealth production – from almost 73% to about 63% today: a fall of some 10 percentage points. This has gone hand in hand with the construction of long and complicated global supply chains of contractors and sub-contractors providing goods and services that drive global brands – too often involving taxation avoidance and unfairly lowering wages and other costs. At the heart of this trend is too often a refusal to recognise or negotiate with trade unions, and sometimes even banning trade union membership. Without organising together, workers are powerless to ensure decent work pay and conditions. Today we can call out some of the European and global offenders. Let’s start with a relatively small example. The banking sector in Slovakia. For over 20 years the Slovak Banking Association negotiated pay rises with trade unions. Last year profits in the sector increased over 23%, and wages went up 1%. The previous year profits had gone up by 13% and wages by 1.5%. The unions were very modest in their demands. But this year the employers’ association suddenly and unilaterally withdrew from collective bargaining. What they want instead is negotiations at company level: with some workers doing slightly better, and others no doubt very much worse. We call on the Slovak Banking Association to act responsibly and get back to the negotiating table! Then something more abusive. Workers at the Gŏsa railway vehicle factory in Smederevska Palanka, Serbia, have been on strike for the last six months because they are owed 20 months’ salary, and employer’s social contributions have not been paid since 2014. Then a global brand: McDonald’s, the fast-food chain. In some countries, McDonald’s are decent employers, in others they are not. In Denmark, they negotiate with all workers at corporate and franchised stores, they pay more than €15 per hour, give guaranteed hours per month, pay more per hour for overtime and offer paid vacation beyond the legal requirement. In France, they negotiate only with their corporate store workers, pay almost €10 per hour, stipulate the normal hours of work, and pay extra per hour for overtime. In the UK, McDonald’s do not have a collective agreement with workers and do not negotiate with a union over working conditions. As a result, pay is lower than in Denmark and France, there are no guaranteed hours for their more than 80,000 workers on zero-hour contracts and there is no extra pay for overtime. Ryanair is another company that refuses to recognise or negotiate with trade unions. Famous for being “low-cost”, its wages are certainly low, which is why it is now cancelling so many flights as it loses pilots to airlines that do recognise unions and pay decent wages. The profits generated by global brands are enormous, and could easily cover modest pay rises that would make a big difference for working people in Europe and elsewhere. 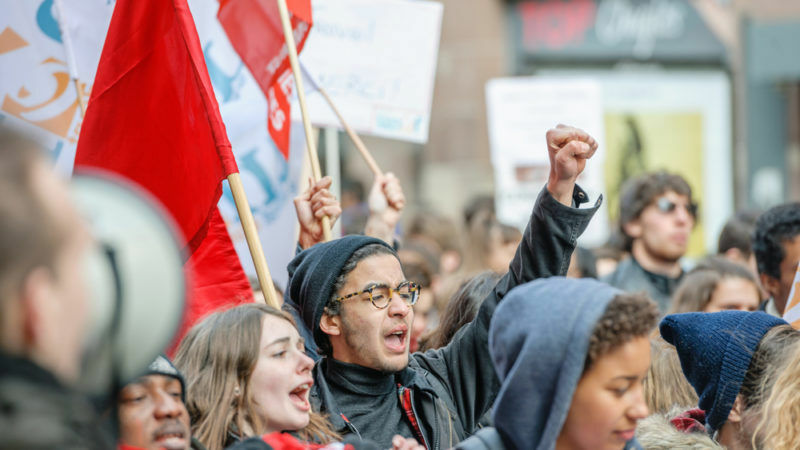 New figures from the International Trade Union Confederation (ITUC) show that Swiss food giant Nestle‘s gross profit of $46 billion (€39 bn) would be reduced by only $2 if it paid an extra €42.55 per month to workers in its supply chains. With additional cash holdings of $14.8 billion (2014) Nestle could easily afford a pay rise for its 339,000 company employees and 4.1 million supply chain workers. Similarly, tech giant Samsung’s gross profit of $70 billion (€59.3 billion) would be reduced by only $1 billion if it paid an extra $50 (€42.55) per month to workers in its supply chains. The cut in profit is barely significant, the difference to working people’s lives would be substantial. Samsung does not allow trade unions in its own company – or in its suppliers! It’s hi-tech with medieval practices and conditions! It’s for all of these reasons that trade unions demand on World Day of Decent Work – on October 7 – to ‘end corporate greed’ and ‘the world needs a pay rise’. To achieve that pay rise we employers to sit down with trade unions to collectively bargain for pay and conditions. It’s the minimum working people deserve – in Europe, in Asia and around the world. The EU should be encouraging collective bargaining – not undermining it in economic policy recommendations as they have in the past.